Harvey rushed toward the small stand of pines set about twenty body-lengths back from the road. Right Claw, Left Eye and Nothing Crow sat on the black wire set up half way between the snow edge of the road and the nearest tree. The three crows squawked loudly at Harvey and Good Christ’s approach, both predators moving side by side to plunge through the snow and escape the savage cold of the steady wind and painfully driven snow. The crows stared down with their bobbing squawking heads, beaks all pointing at the same tree where a single snowed over a crease of tracks that could barely be made out across the top of the iced over snowpack. Good Christ stopped upon reaching the tips of the sharp-pointed pine’s lowest branches but Harvey plunged right under seeking as much protection from the elements as he could get as quickly as he could get it. The stark difference presented by the bone dry bed of needles under his damaged paws and the complete stillness of air after the torrent of wind he’d run through caused him to almost miss Bad Taffy’s presence. Harvey padded to the bottom of the pine’s thick trunk and settled down, facing the huddled form of the other cat. Bad Taffy blinked so Harvey knew she was still alive. 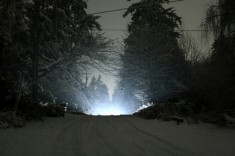 Almost instantly, Good Christ appeared under the spreading branch of the pine, his significantly larger size causing a cascade of misting snow fall through the air. Bad Taffy’s fur flared out to twice her size and a low growl came from deep down in her throat. Harvey looked from the cat to the fox and back. He knew instinctively that if Good Christ was going to attack then the attack would already have occurred. It was obviously apparent that the situation was not a predator/prey situation. The weather, not more than three feet from where they hunched down on the dry needles was so bad that all other concerns and motives were submerged. Nearly immediate survival was the only thing that mattered. Only the crows, somehow, and the fox, because of a coat of super thick fur and thick foot pads would have any chance of braving current conditions. Bad Taffy and Harvey were stuck under the tree. When nightfall came once again, and the temperature dropped far lower there would be no braving anything. from each. Harvey and Bad Taffy both stared but the fox put its muzzle down on front paws and closed his eyes. Bad Taffy moved a bit closer to the bigger animal. Harvey didn’t stir a bit. It was warmer. He wasn’t sure whether the warmth was caused by the temperature going up or because the three of them were obviously stuck where they were together. Once again, there was nothing to be done. A slight powdering of snow rained down briefly from higher in the tree. Harvey’s ears perked up before he pulled back his head to look. The crows were in the pine, moving from branch to branch. Either the cold or their usual insatiable curiosity had driven them down from a cold but safe perch atop the wire. Once firmly ensconced only a few body lengths above where Good Christ, Bad Taffy and Harvey lay below, they began their quieter form of chattering or bickering among them. For the first since every encountering the crows Harvey felt a strange feeling of distant companionship. Somehow, for whatever assembled reason, they had all come together and ended up inside the prickly but protective arms of the standing pine. Harvey looked slowly about the dark interior under the sheltering arms of the pine tree, taking in the unlikely collection of animals that might never be found to be so close to one another under any other circumstance. The crows muffled but still noisy complaints were muted, Good Christ and Bad Taffy ignored the fact that their bodies were touching one another while they lay in identical poses, with their muzzles resting on front paws and their eyes closed. Only Taffy’s shivering indicated the dire circumstances that held them all trapped against the bitter cold wind and blowing snow outside. A soft white light blinked on and off, its glow so soft that only Harvey, long used to the phenomena paid any attention to it at all. The glow came from Harvey’s own collar. Long ago his alpha human had attached a strange plastic bulge to his fine silver and red leather color. The color always blinked to let Harvey know when the humans were looking for him. Before the addition to his color the humans had been terrible about finding him, which had been okay, but after the special alert thing was attached the alpha human, and sometimes even the females, always showed up not long after the collar blinked a warning. The light blinked again. Harvey knew he was further from home than he had been for a very long time. He hadn’t traveled so far since well before the blinking bulge was added to his collar. If his humans did manage, even with their terrible hunting skills, to find him then how would they know to look under the pine? What would Good Christ do to the humans if they did look under the tree? There was nothing to be done. The light did not blink again for awhile, as Harvey knew it would not. The blinking meant the humans might be coming, although maybe not so far as to be of any help. The light would blink again if they got close. The closer they got the more it would blink, if it blinked again. How the thing on his collar knew where the humans were or what they might be doing was another mystery that did not deserve thought. It just was. And there was nothing to be done. The wind continued unabated. All three crows worked their way down the branches until they balanced together on the bottom most branch of the tree, less than a body length above the three resting predators below. It was as if they knew that the normal predator/prey rules had been called off for the duration of the storm. 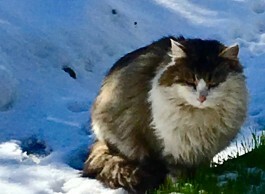 Harvey knew the temperature had gone up because the snow was melted from Bad Taffy’s fur and he could not see his own breath anymore. Animals could survive better together than they could alone, unless they got really hungry. The wind continued unabated. All three crows worked their way down the branches until they balanced together on the bottom most branch of the tree, less than a body length above the three resting predators below. It was as if they knew that the normal predator/prey rules had been called off for the duration of the storm. 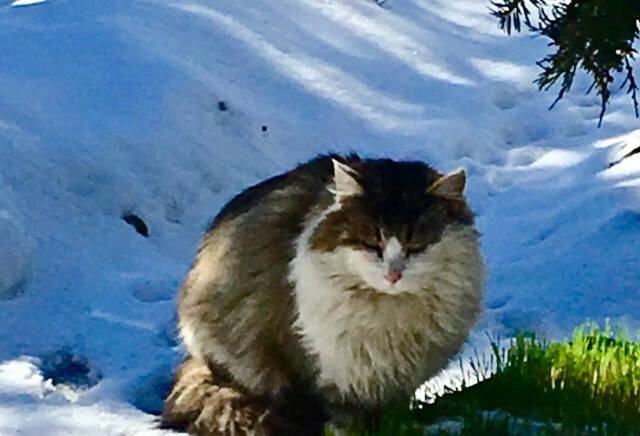 Harvey knew the temperature had gone up because the snow was melted from Bad Taffey’s fur and he could not see his own breath anymore. Animals could survive better together than they could alone, unless they got really hungry. His alpha male would be coming. His alpha male always came over time, no matter how embarrassing or frustrating such appearances could be. There had been those wonderful times when Harvey was younger when the humans of his pride could call out all night long while he sat under a nearby pine taking in the nighttime winds and wonderful aromas of the forest that never slept. The humans never knew Harvey was there, only a few body lengths away, secure in the knowledge that they themselves were exactly where they were supposed to be. But the new blinking collar attachment had changed all that. The collar blinked at night and if Harvey stayed out in the forest long enough its blinking changed colors. There was no effective night hunting while wearing such a thing. But in the middle of winter blizzard everything was different. His alpha male would be coming. Staying under the pine was possible for a shore period of time but the temperature would drop so low during the night that surviving under the tree without serious damage might well be impossible, at least for he and Bad Taffy, and Taffy was weakened from having already spent a night under such conditions. Harvey stared at the side of Good Christ’s head. The fox just lay there with his head on this paws and eyes closed, not more than two paw widths away, like it was supposed to be there instead of out doing whatever foxes did in winter blizzard conditions. The crows snuggled together on a branch way too low for comfort, although Right Claw, Left Eye and Nothing Crow seemed quite content to be a part of the unlikely group just under their feet. They mused allowed while cleaning feathers, although their sounds were muted to the point where they were almost welcome to Harvey’s ears. The wind blew, a slight misting of jostled snow filtered down but the area inside the bottom branches of the pine where they lay was warmed to the point where it wasn’t freezing. It wasn’t comfortable either. Harvey knew why he was there, to get out of the killing blizzard blowing outside, but he wasn’t sure about what to do if his alpha human showed up. There was no warning. All sound was masked by the storm outside and the musing of the crows inside. The branches in front of Harvey broke open and the human stuck his upper body inside. Bad Taffy, Good Christ and Harvey lay frozen in place. 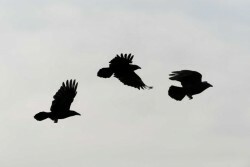 Even the crows did not move. They all stared at the face of the human, which was covered in a dusting of snow that also swirled around down through the hole he’d made. “There you are. God, I love GPS,” he said, reaching both gloved hands out to grab hold of Harvey. Good Christ was gone so fast it was like the fox was never there. The human jumped back. “What in red hell was that?” he exclaimed, in shock. Undeterred he reached back in and grasped Harvey mid-body. Harvey gave him no resistance until he was dragged to the human’s idling piece of giant metal. The human opened the back door and Harvey jumped. Not into opening onto the seat, but instead to the snow swept ground. He twisted around and then stuck his head up from under the car’s edge to peer at his human. “Jesus,” the man forced out in frustration. He leaned down to reach again but Harvey back away. The human stood up. “I got it. That other miserable cat. Is that it?” The human walked the few feet back to the pine and broke the branches apart once more. He returned with Bad Taffy extended out in front of him, her claws bared and pawing uselessly as she was carried along. He threw the cat into the back seat and pushed the door shut. “There, now are you going to come out or stay here and freeze to death?” the human intoned, placing his hands on his hips, as if he had all day to wait. Harvey came out from under the car, girding himself to be man handled once more. He looked up once he got out from under the car. The crows sat on the roof of the vehicle, staring down, as if recording the entire embarrassing event for future play back at the forest. The human ignored the crows, grabbed Harvey up and tossed him unceremoniously into the back seat. Bad Taffy sat pushed into the far corner of the seat. She growled once. Harvey growled back, just to make sure Taffy understood his natural predatory supremacy. He jumped into the empty front passenger seat where he normally sat when forced to be on his way to other more discomforting places. “Shoo,” his human said from outside the car, encouraging the stubborn crows to give up their place perched over his door. They drove in silence. Harvey normally explored every inch of the inside of the strange vehicle but this time merely sat and stared over the edge at the passing scenery. Looking ahead he saw the nearly invisible place where Good Christ had dived to avoid being seen as they passed. For some reason the sight gave him some comfort. Foxes were to be avoided, not understood and certainly never to be lain next too under pine trees no matter what the conditions. The car passed through the forest on its way to the house. The snow as so heavy that Harvey could barely make anything out. But it wasn’t so thick that he didn’t see Thumper, the giant rabbit, sitting next to the stream, looking like a big rock covered with snow with two eyes peering out. The three crows landed above the rabbit, showering snow down, but Thumper remained undisturbed. Harvey didn’t hesitate. He shot across the seats without looking back and scurried through the garage door open to the inner house. The two females tried to grab him as he went through the opening but he was way too fast for that. The door closed behind him. The fire in the fireplace was burning bright, throwing waves of heat. Harvey stopped in the middle of the room and looked all around. Everything was right in his territory. Josie, the indoor servile cat that refused to accept servitude as her due, looked out from under the couch. Her expression was inscrutable. Either she was glad he was home or sorry. There was nothing to be done about that. Only Little Floyd would somehow have to be made aware that Bad Taffy was safe and sound in Harvey’s garage, but that could wait until the following day.